Cover Sheets as the name implies are the essential cheat sheets for all kinds of books and other readable stuff. This consists of diaries, textbooks, workbooks, storybooks, etc. ; The Cover Sheet Examples in this section can be used for both business and private use. All these are highly adaptable. You can even use them for gift packs as they are super delicious regardless of the occasion. You have numerous examples to look over. Finding a Fax Cover Sheet format online may not be tedious task these days with the technology. But still, we are giving you one example which you can refer. 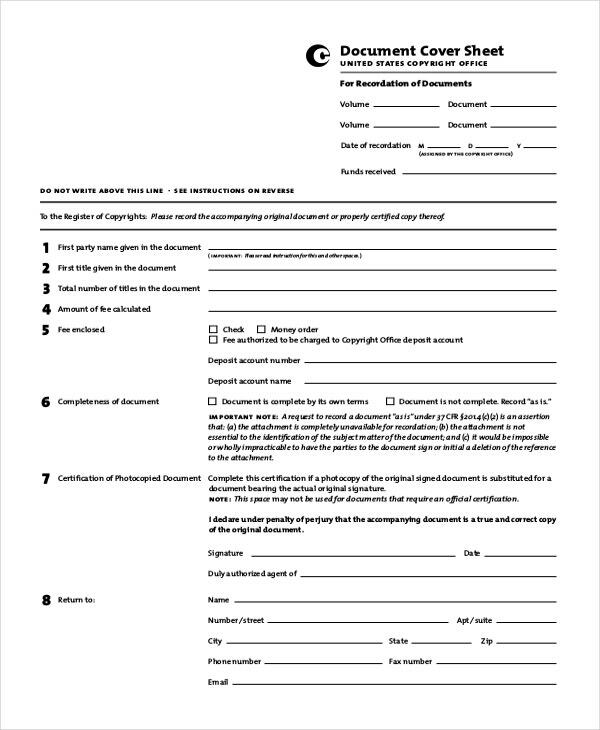 This Fax Cover Sheet Example help you with a professional structure. Are you about to pen your College Assignment? This Assignment Cover Sheet Example is for the same item. You can edit both the content and picture and can compose your thoughts. Though there aren’t any particular guidelines on how a document cover sheet looks like, this Document Cover Sheet Example comes with professional elements, which puts it ahead of the race. 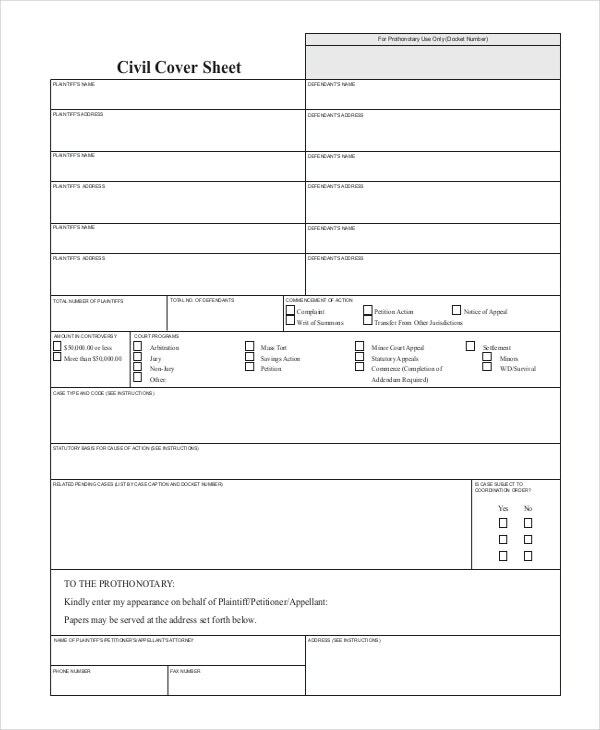 The Civil Cover Sheet Example is exclusively for Court Administration purposes. You can use these new filings for all public related documents before commencement of any action. 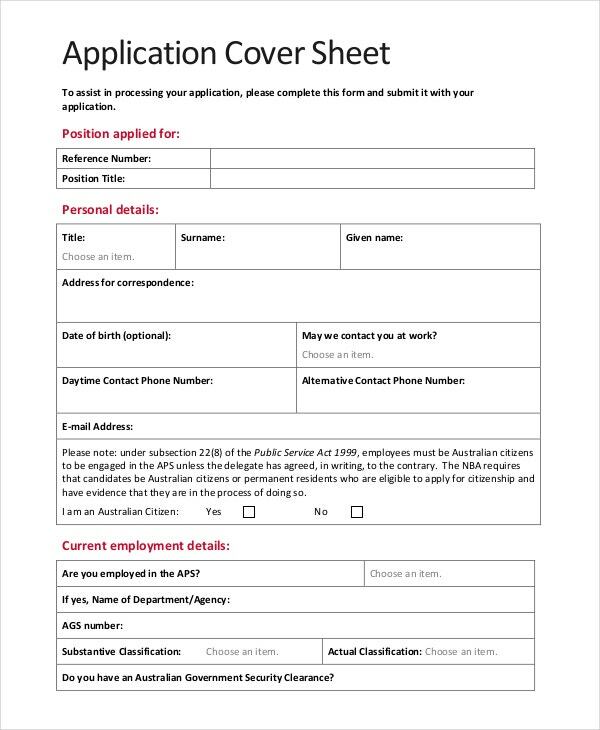 Is there a required field that it missed out? Reveal it not. 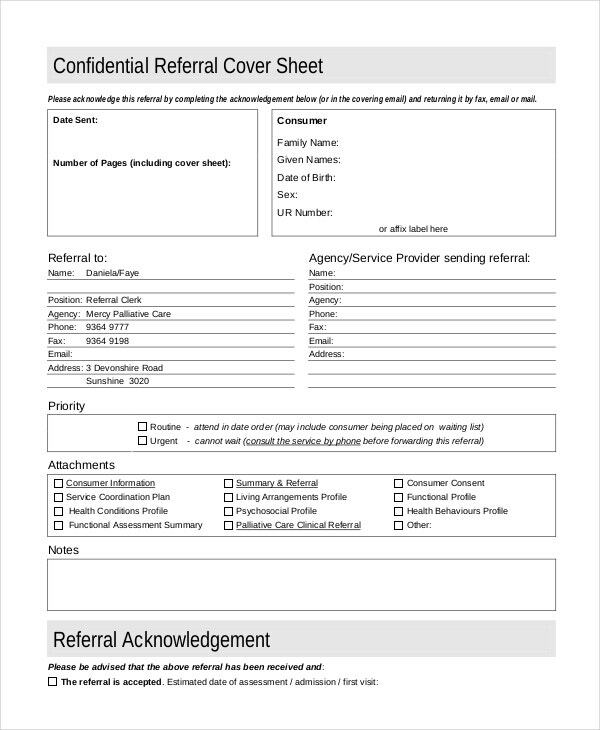 This Confidential Referral Cover Sheet Example has all the familiar terms and conditions along with bold and big lettering ‘Confidential’ stamped on it. Use it for the facsimiles, which are legally privileged. 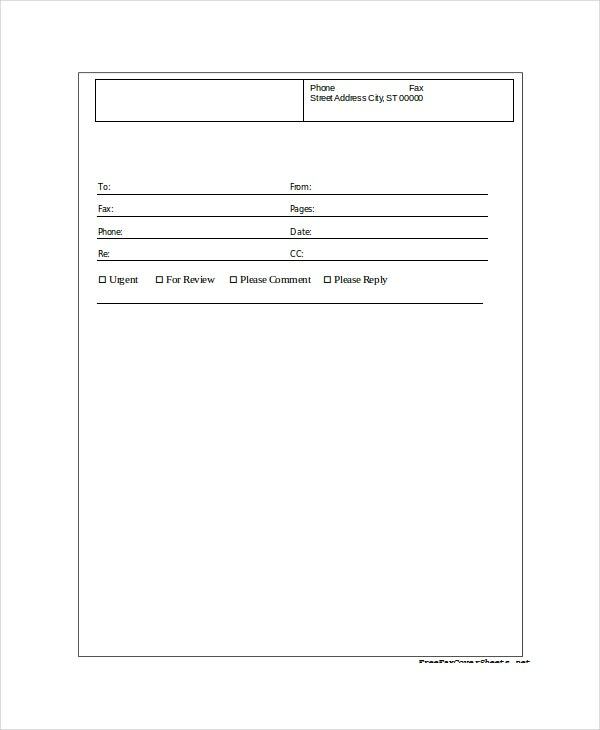 On the off chance that your business invests a ton of energy sending faxes to different organizations and clients, Fax Cover Sheet Templates will prove to be useful for your authoritative workforce. 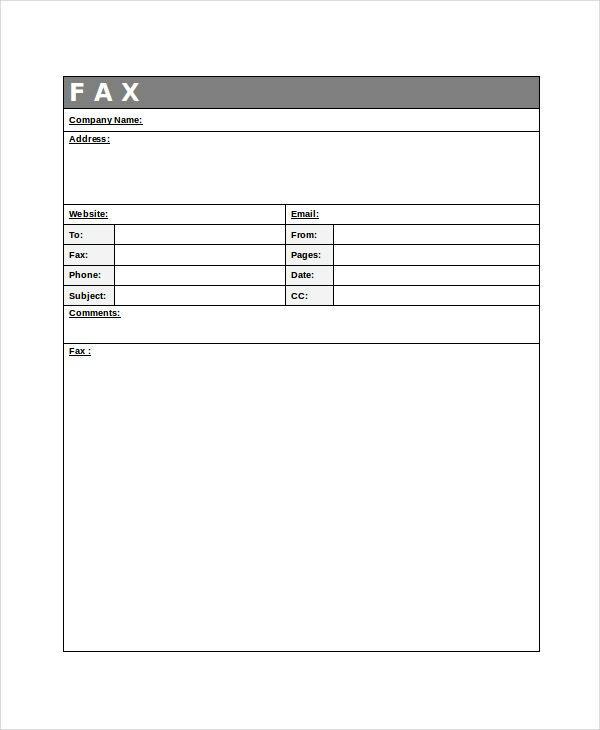 This Generic Fax Cover Sheet put before the archives that are being faxing and tell the beneficiary of the fax what number of pages are incorporated into the fax and besides your contact data. The role of a Cover Sheet in a Recommendation letter is the clincher. 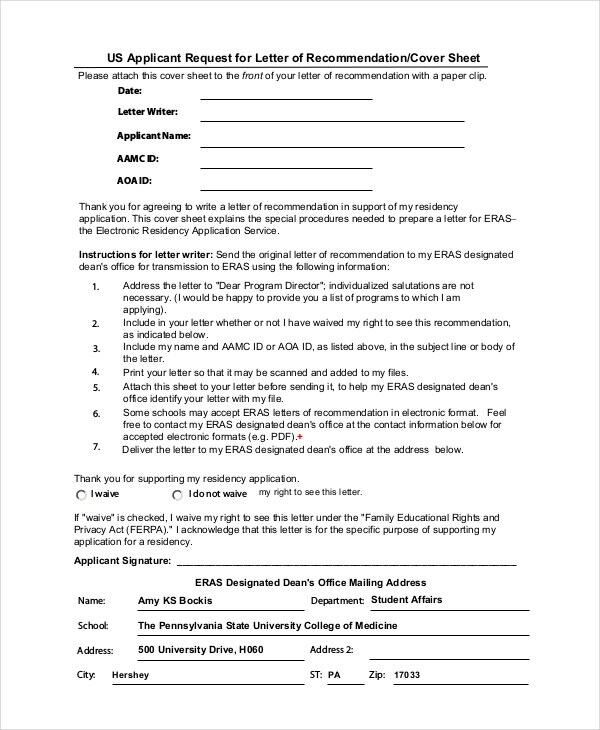 This Recommendation Submission Cover Sheet Example gives an impressive facade to your plea. Because at times, you will not have much time to impress. 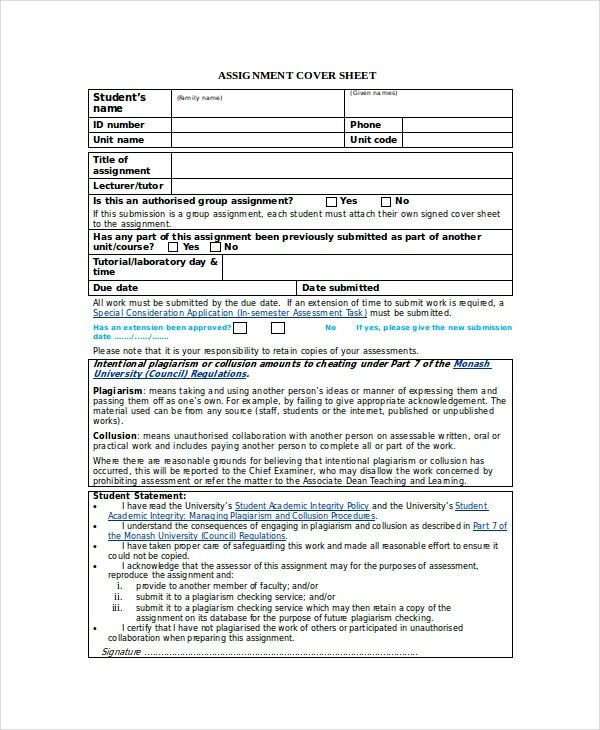 Assessment Cover Sheets are the signed forms those are attached to the students’ assignments while applying to a grad school or university. This Assessment Cover Sheet Example comes with fillable fields and other details. 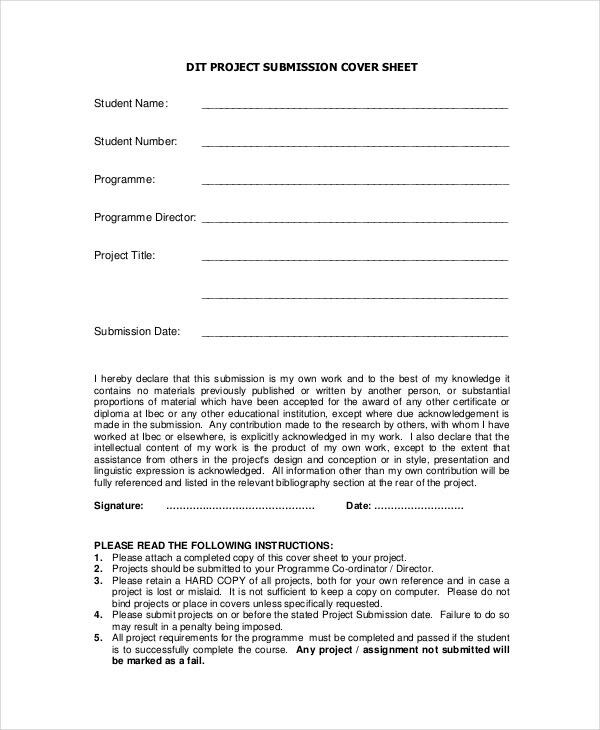 This Project Submission Cover Sheet Example is a salvage in your bustling submissions. Don’t waste your precious time in preparing the exterior portion. Let the sample takes care of that, and you use that time for improvising your project report.